On a keto diet but cravings for some delicious cookies? 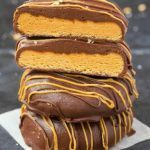 These Keto Chocolate Dipped Peanut Butter Cookie Sandwiches are for you! It will be ready in just 30 minutes. In a large mixing bowl, combine the egg, peanut butter, erythritol, vanilla extract, baking powder and salt. Using a hand mixer, mix until all of the ingredients are well incorporated. Form the mixture into 1 – 1 1/2 inch balls (12 total). Place the dough balls on the baking sheet, flatten and use a fork to make criss cross marks on each one. Bake for 10 minutes. Remove cookies from the oven and cool on a cooling rack before serving. Combine the mascarpone, cream cheese, erythritol and vanilla extract in a mixing bowl. Using an electric hand mixer, beat the ingredients until they are well combined. Transfer the mixture to a piping bag or a Ziploc bag. If using a Ziploc bag, snip off the corner of the bag so you will be able to pipe the mixture out. Combine the chocolate chips and coconut oil in a small bowl and microwave until they are melted. Still to combine. Alternately, this can be done in a double-boiler. Line a plate with parchment paper or wax paper. Once the cookies have cooled, pipe some of the frosting onto 6 of the cookies. Use the other 6 cookies to top off your cookie sandwiches. Dip one half of the cookie in the melted chocolate and swirl to coat. Place the cookie on the prepared plate and sprinkle with a little Maldon sea salt. Repeat this process with each cookie sandwich. Place the plate of cookies in the refrigerator until the chocolate has returned to a solid state.